The images above show possibilities of Chemical Color Imaging in wood recycling. Wood recycling is a well established industry. While in the last years metal parts were typically separated, the focus is now changing to get any non-wood parts out of the material stream. Especially various plastics can strongly influence the subsequence processing of recyclable wood. By using the Chemical Color Imaging technology these unwanted parts can easily be detected. Due that a hyperspectral camera together with a Perception System can easily be integrated into an existing machine vision solution of the customer, chemical and molecular information is represented in a format that everybody can understand – Color. Consequently everybody who can handle color data is now able to sort according to chemical information. 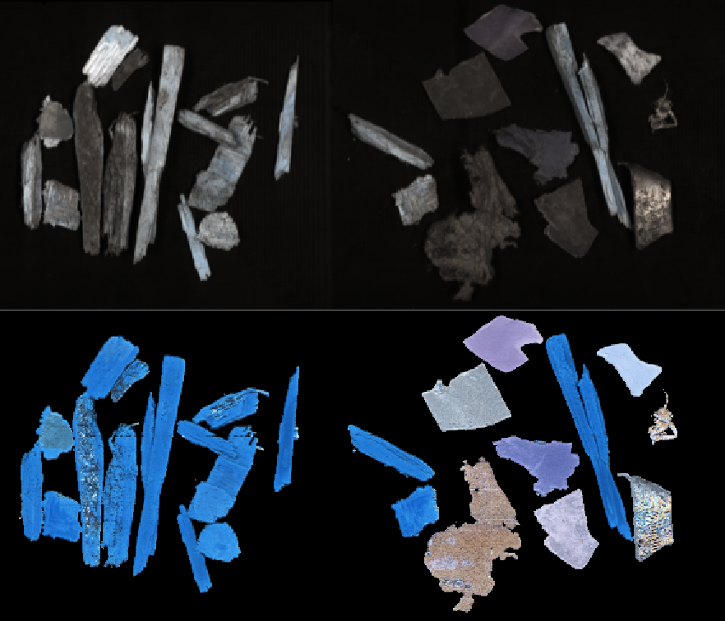 The lower image show one of a series of possible perceptions by applying Chemical Color Imaging to hyperspectral data. The left pile is showing only wood parts, while the right pile is a mixture of wooden parts and polymers. The hyperspectral imaging data were provided by the Finnish company SPECIM, Spectral Imaging Ltd. and were captured with a hyperspectral camera working in the wave length region from 900 – 1700nm.